I love my Blake Makes readers. I love them even more when they send free food! 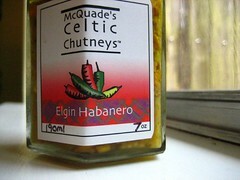 McQuade’s Celtic Chutneys sent me a few jars of their delicious chutney a couple of weeks ago, and I’m just getting to posting the amazing meals we made. 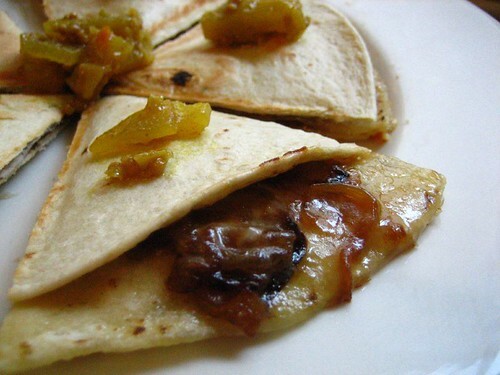 With their Elgin Habanero chutney, we made these caramelized onion quesadillas. I thinly slice 2 onions and cook them over medium-low heat in a little olive oil and butter for about 45 minutes. When they’re coffee-colored, they’re done. Spread the onions on a tortilla, and dollop hunks of Camembert. Place another quesadilla on top and cook until golden and crusty. We garnished with the chutney. To be honest, I was a little hesitant to eat it because it was Habanero and I didn’t want it to blow my head off. It was spicy at all. It was this really nice mix of sweet and savory. To me, there was a faint mini-gherkin quality about it. It went very well with this meal.